When it comes to painting, it’s hard not to think of one iconic name: Bob Ross. Ross is known for his calm demeanor, soothing voice, and of course, that amazing hair. His love of animals and nature shined as much as his skills with a brush. Every one of his paintings seemed so effortless, and watching him work is mesmerizing. It truly is a joy to watch the Joy of Painting. Here are some happy little facts about Bob Ross! It’s hard to of Bob Ross being anything but a gentle painter, but he spent over 20 years in the military, retiring as a Master Sergeant. Bob Ross yelling at people? Now that’s a funny thought! Bob Ross is such a master painter he would film a 13-episode season in just two days. This would give him more free time to do some of the things he loved like spending time with friends, loved ones, and mother nature. He also gave art lessons when he wasn’t filming. 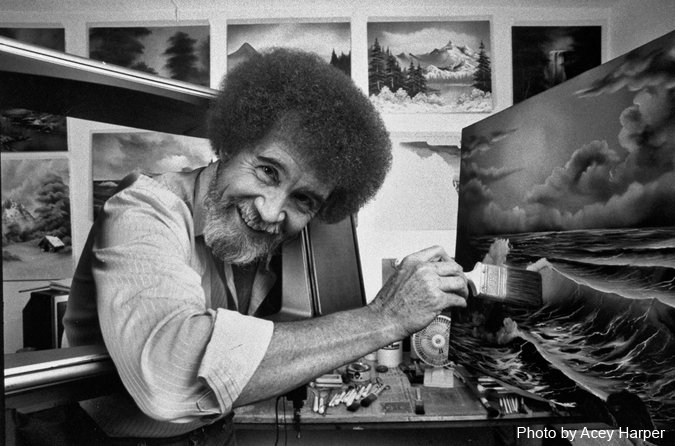 With how popular The Joy of Painting was, you would think Bob was raking cash from the show. Bob never saw a single dollar from the show. He made his money by selling art supplies and through art lessons. When you think of Bob Ross you immediately think of two things: his paintings and his hair. His hair is beyond iconic. But did you know that his hairstyle wasn’t all it seemed? To save money on haircuts, Bob permed his naturally straight hair. He actually hated the perm but it became his signature look and he decided to keep it. Bob Ross was a superstar in Japan thanks to The Joy of Painting. The show aired twice a day, and it seemed people couldn’t get enough Bob Ross. The show was dubbed over in Japanese so many viewers didn’t get the chance to hear his amazing gentle voice. That is until Bob visited the country (and was subsequently mobbed by fans)! Ross shot 403 episodes of The Joy of Painting and made three near-exact copies of each painting per episode. The first copy always hid off screen, and Ross referred to it while the cameras rolled. Ross painted a third copy when filming finished. This time, of his assistants stood behind him to take photos of each brushstroke. These pictures went into his how-to books. Now imagine doing all of this in TWO DAYS! Bob Ross received over 200 letters a day from fans. In one letter, a fan wrote to him saying that they were color blind and couldn’t paint along. Being the caring man the Bob was, he devoted an entire episode to a grayscale painting. He proved that you don’t need a rainbow of colors to make something beautiful. With the sheer scope of paintings Bob Ross created, how quickly he could produce them, and his enormous popularity, it is easy to imagine that he made a fortune selling his paintings. He never sold a single one. Instead, he would give them to both PBS and donated them to charities for auctions. Nintendo wanted to make games about him. Not that long ago, Ross’s popularity remained so high that Nintendo wanted to make a game series about The Joy of Painting show. The project was scrapped pretty early on into development due to production problems. It’s a shame that the world will never know how amazing that game could have been. Bob Ross is still as relevant as ever. It’s easy to see why the man is such a pop culture icon! With board games like Bob Ross the Art of Chill and Funko releasing a line of Pop! figures of him, he is everywhere! Even Deadpool 2 paid homage with one of its trailers! Everything about Bob Ross is cool and I hope you learned a little something new about one of my favorite painters. Feel like channeling your inner Bob Ross? Bookmans locations across the state host Studio Nights: Paint Editions. These free painting classes where you can let your creativity fly. Remember there are no mistakes – just happy accidents!